C.A.R.T. 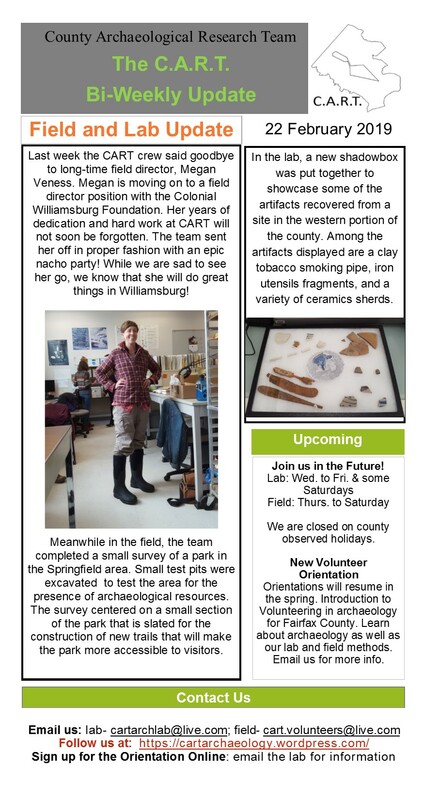 Archaeology | The blog of the County Archaeological Research Team, part of the Archaeology and Collections Branch of the Fairfax County Park Authority, conducting ongoing archaeological investigations on Park land across Fairfax County. Absolute dating: The calculation of age in exact calendar years of an object or event. It is also referred to as chronometric dating. Absolute dating can often be achieved through scientific processes such as carbon-14 dating and dendrochronology, dated artifacts such as a coin, or the historic record. Aerial survey: A surveying method that locates archaeological sites from the air involving primarily aerial photography. Aerial survey is one method that can reveal detailed information without disturbing the ground. Archaeobotany: The study of plant remains found in the archaeological record as well as the interaction between humans and plants. Assemblage: A collection of artifacts that share a common context. Classification: The categorization of archaeological materials into distinct groups in which the materials of a group share several defining characteristics. Excavation: The systematic digging and recovery of material remains at an archaeological site. Dendrochronology: An absolute dating technique that involves examining tree rings. The trunks of trees form rings annually (one ring for each year the tree is alive) that vary in size and condition according to climatic changes allowing for the establishment of long chronological tree-ring sequences. Faunal remains: Fauna is the animal life of a particular region, habitat, or geographical area. Animal remains can include bones, teeth, shells, etc. Floral remains: Flora is the plant life of a particular region, habitat, or geographical area. Plant remains can include seeds, pollen, charcoal, etc. Paleolithic: The prehistoric period that is associated mainly with the advent of stone tool usage by humans as well as hunting and gathering as the principal method to obtain food. Radiocarbon dating: An absolute dating technique that involves examining the decay rate of carbon-14 in organic materials. All living organisms contain carbon-14. The decay rate of the element is well-known. This technique is one of the most widely-used methods in archaeology. Relative dating: The calculation of age of an object or event in relation to another object or event, but not in exact calendar years. It is usually said to be before, after, or contemporaneous with the object or event to which it is being compared. Remote sensing: A form of surveying that locates archaeological sites or features using non-destructive methods and does not require disturbing the ground including LIDAR and ground-penetrating radar. Sherd: In prehistoric ceramics, it is typically any broken ceramic vessel fragment. In historic ceramics, it is typically any ceramic vessel fragment that has two intact walls or surfaces. Shovel test pit (STP): A small excavated pit dug in a systematic pattern and used to detect whether archaeological remains are present. Shovel test pit size and shape is regulated by each state’s State Historic Preservation Office (SHPO) with the Virginia Department of Historic Resources (VDHR) determining the size of STPs to be at least 15 inches (38 cm) in diameter. Site: Defined by the VDHR as an area that displays evidence of previous human activity greater than fifty years of age that can have an established boundary. Sites can be domestic sites, quarries, roads, shipwrecks, etc. Survey: The examination of the terrain to attempt to find evidence of previous human activity and, therefore, the discovery of an archaeological site. Surveys in the United States are often conducted in phases (Phase I, II, and III). Thermoluminescence: An absolute dating technique that involves examining the stored energy in certain types of rocks and sediments. These crystalline materials store energy from the sun, and if heated, they release the stored energy in the form of light at a known rate. 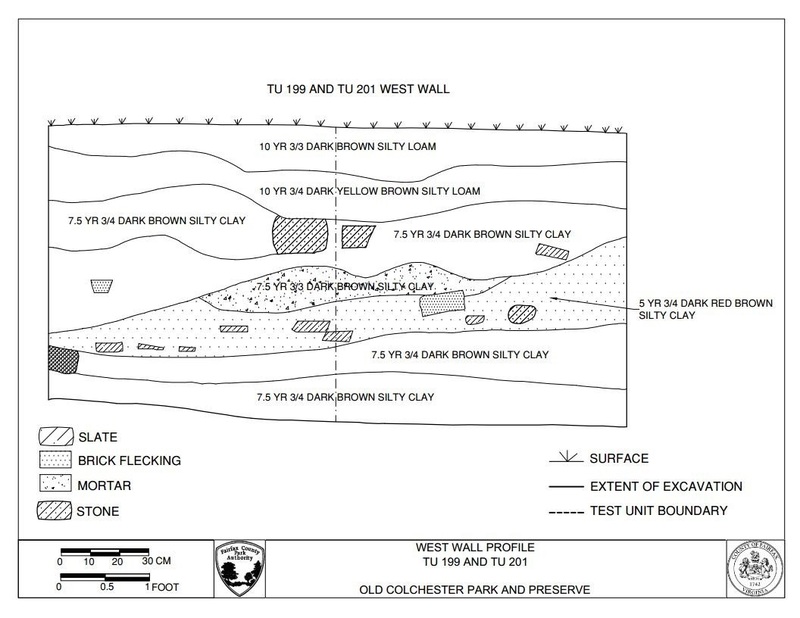 Test unit (TU): An excavation area of a standardized size commonly 3’ x 3’, 1m x 1m, 5’ x 5’, or 1.5m x 1.5m. Trowel: A mason’s trowel is a flat metal tool that has either a pointed tip or a flat squared off end. For archaeologists, the most commonly used is a mason’s pointing trowel, but the margin trowel is also common. The trowel is adapted by archaeologists through sharpening the edges. It is one of the main tools used by archaeologists in excavations to carefully excavate soils, cut roots, and clean excavation areas. Zooarchaeology: The study of animal remains in the archaeological record and their interactions with humans. Harris, Jennifer F. 2001 Jargon Commonly Used by Archaeologists: A Glossary of Terms. Early Georgia 29(1): 87. http://www.georgia-archaeology.org/EarlyGA/may2001/EarlyGeorgia_29_1_10.pdf, accessed March 1, 2019. Hirst, Kris. 2018 Luminescence Dating: A Cosmic Method of Archaeological Dating. ThoughtCo. https://www.thoughtco.com/luminescence-dating-cosmic-method-171538, accessed March 1, 2019. Kipfer, Barbara A. 2019 Archaeology Wordsmith. 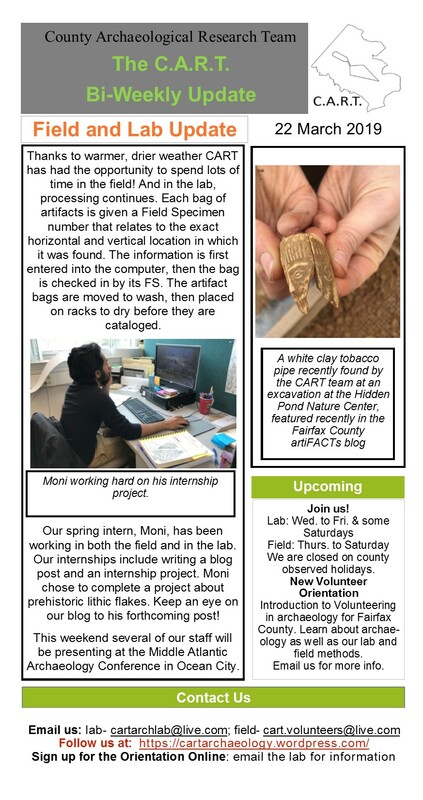 Web page, https://archaeologywordsmith.com/, accessed March 1, 2019. Virginia Department of Historic Resources. 2017 Guidelines for Conducting Historic Resources Survey in Virginia. https://www.dhr.virginia.gov/pdf_files/SurveyManual_2017.pdf, accessed March 8, 2019. West Virginia Department of Arts, Culture and History. 2018 Glossary of Archaeological Terms. Web page, http://www.wvculture.org/shpo/glossary.html, accessed March 1, 2019. Recording field notes is one of the most important things archaeologists do in the field. Field notes often represent the final record of what was excavated, as archaeological excavation is an inherently destructive process. Along with written descriptions of what archaeologist’s find and see, visual records, such as photographs and scale drawings, are equally important. The process of drawing or mapping is a clear and precise way to accurately record an area such as a test unit or feature in a way that gives the archaeologist more control than a photograph alone. Photos can be a great tool to quickly record a lot of visual data in the field but they can be blurry, washed out from the sun, or tilted at a strange angle. Drawn maps allow the archaeologist to create a representation that records exactly what they see in the field. For more information on test units or features and how they are excavated please see some of our other blog posts. The process of mapping a test unit is often simple, although sometimes it can be much more complex. Here at CART our archaeologists use a scale in centimeters since we measure our test units by the meter. We use the squares of a grid on a piece of graph paper to represent a certain measurement on the ground. The area that each square represents varies depending on the scale being used. A 1×1 meter test unit fits easily onto the page where one inch of graph paper represents 20 centimeters along the test unit. 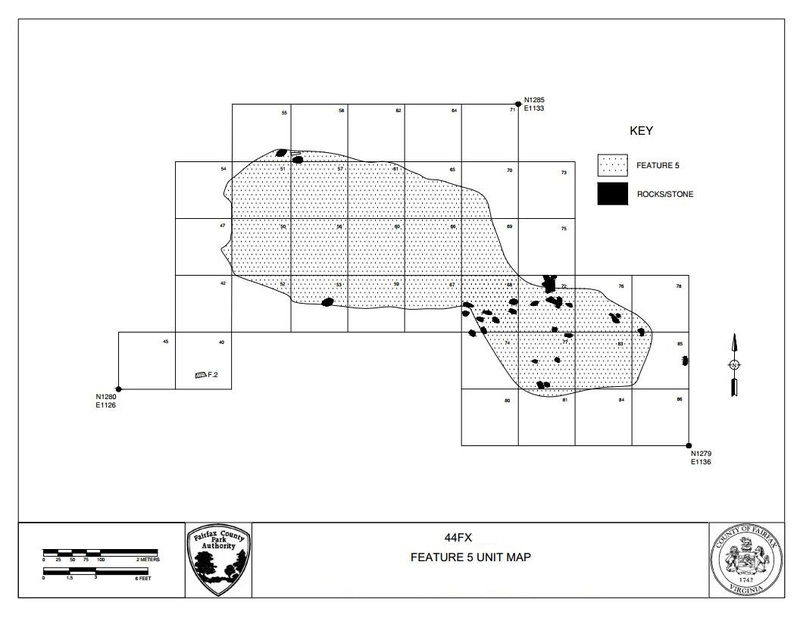 By assigning points within test unit, shapes of the features like soil stains and stones can be drawn accurately. There are two main types of drawings done in the field: planviews and profiles. A planview drawing is essentially a to-scale image of what the area such as a test unit looks like from above. A planview drawing is similar to a roadmap, showing the horizontal boundaries of things often within a particular test unit or feature. When the soil at the base of the excavation contains subtle color and texture changes the best way to record this is through drawings and lots of notes about what you see! Photos aren’t the best tool to show depth or changes in elevation or soil texture within the unit, but drawings allow for those sorts of differences to be added with a key so that others can understand what is being represented. Planviews can also be utilized in larger scale drawing or something more complex like a stone foundation or a brick floor. When a large feature like a cellar is found, the group of test units surrounding that feature can become too large to use a camera to record it. When this happens a planview is created to accurately map the feature in a way that would be very difficult to obtain via a photograph. Sometimes there are test units that contain lots of rocks or bricks making a more complex image, planviews are one of the best ways to ensure that the measurements are recorded correctly. Note the north arrow and the scale. Cardinal directions, scale, project, site and location information are vital to every map. The second type of drawing is called a profile. A profile follows the same idea as a planveiw drawing, only think of a profile like a face of a building, it is a map that shows the layering within a test unit’s walls. 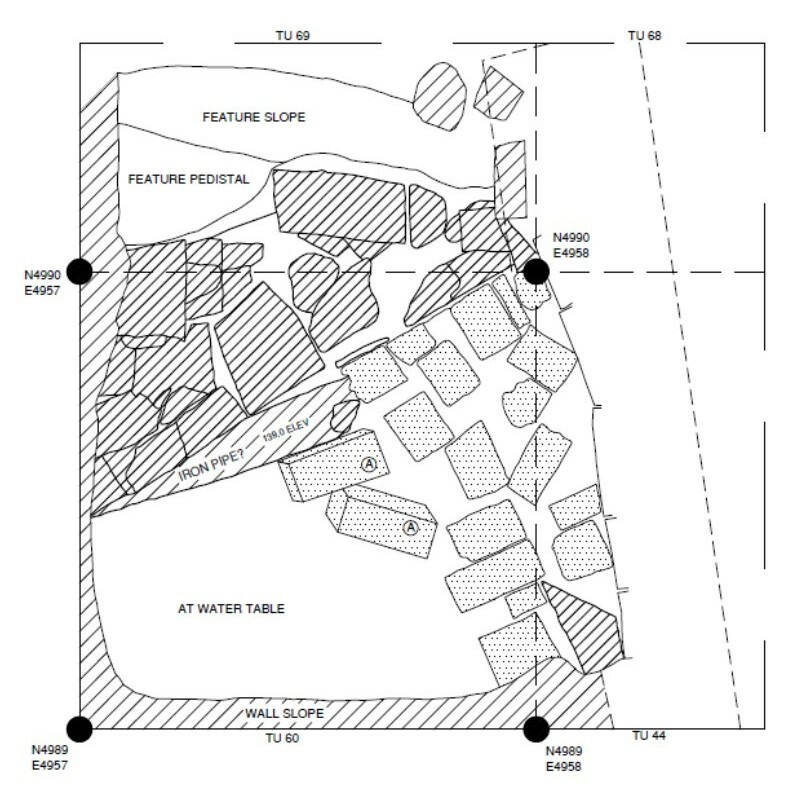 These walls can be just as important as the base of a test unit because profiles are the best way to show the stratigraphy an archaeologist encountered while excavating a unit. The process of mapping a profile is similar to that of a planview, but vertical as well as horizontal measurements are recorded. Subtle soils changes, plowscars, pit features, or types of soils staining indicating depth can be seen in the walls of a test unit. Vertical measurements are taken by measuring down from a known elevation or datum. At CART this is usually done using a line level and a chaining pin. Other important elements to these map types include the key and soil color description. Just as in any map a key is very important to understanding the different elements being represented within the drawing. Things like bricks, stones, tree roots, elevation change, soil inclusions like charcoal, and layer changes are often seen in these drawings. In some situations, artifact location is very important. The artifact or artifacts will be left in place to be mapped so that its exact location can be noted. Soil colors are also necessary to understand stratigraphy and are usually a main focus of profile drawings. Archaeologists will use the Munsell soil color chart to try and match what they are seeing to a previously assigned code and color description, this way there is a standardized list of color names hopefully eliminating any confusion or misinterpretation through mapping. References are incredibly important and we use a lot of them. Here is a list of some of our favorites. We may add a few in the future. The pictures in the slide show above are examples of artifacts about which we could use a reference to discover more. The lab is closed to volunteers today. A reminder and repost: The Archaeology Team prefers everyone live long full happy lives, so in any weather event, please stay off the roads if there is any question of safety regardless of the following protocol. The Park Authority follows Fairfax County Government closures. If Fairfax County Government is closed: the office and archaeology lab will be closed & any fieldwork suspended. If Fairfax County Government opens late or closes early: the office and archaeology lab will be closed & any fieldwork suspended at the announced time of day. If Fairfax County Schools open late or are closed: It is possible lab and field volunteering may begin late or be suspended. Please check with us via email when we will be open before coming to volunteer. If Fairfax County Government Employees have the option of “liberal leave”: It is possible lab and field volunteering will be suspended. Please check with us via email when we will be open before coming to volunteer. Please note Fairfax County Park Authority weather procedure. Park facilities may still be open and classes still scheduled even when the CART lab is closed.